Norming Asset Management is a powerful and complete asset management solution on Sage 300 ERP. 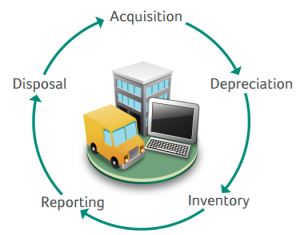 The core module; Asset Accounting is used to process the entire asset accounting transactions, including acquisition, depreciation, adjustment, disposal, merge and split. You can add additional modules as Asset Tracking, Asset Maintenance and Asset Leasing which can be used to facilitate the maintenance and lease management. Norming Asset Management has provided asset tracking solution on barcode scanner and RFID reader. Now you have another choice: use mobile device as a barcode scanner or QR code reader. Norming eTracker is a mobile based tracking tool that is available on Apple Store and Google Play. It helps you to Track where your fixed assets are, who has your assets, and when your assets are due back. 1. Adds the description field for asset unit. 1. Acquisition transactions can be processed in prior year. 2. Passes the P/O invoice number on to the Asset Register for aquisition with P/O Invoice method. 3. Depreciation can be processed across years. 4. Depreciation reversal can be processed across years. 5. Enhances the Bulk Disposal functionality by providing the I/C processing method. 6. Improves the Split functionality to allow to maintain more asset’s information. 7. Enhances the Asset Listing and Asset Schedule reports by providing more 'Sort By' and 'Filter By' options. 8. Provides the 'Post All' features for all the batches. 1.1. Documents can be attached to a started maintenance order. 1.2. Comments can be added for ‘Start’, ‘Close’ and ‘Void’ action on the Maintenance Order screen, and history record will be generated accordingly. 1. Provides Mobile app(named as Norming eTracker) for real-time Asset Tracking. 2. Supports the QR codes scanning. 3. Supports the RFID(Radio-frequency identification) scanning. 4. More scanner brands & models can be supported. Asset Management 2018 requires Sage 300 2016(or later) and User-LANPAK. If you use General Ledger, you need General Ledger 2016 or later. If you use Account Payable, you need Account Payable 2016 or later. If you use Account Receivable, you need Account Receivable 2016 or later. If you use Purchase Order, you need Purchase Order 2016 or later. If you use Inventory Control, you need Inventory Control 2016 or later. If you use Projection Job Costing, you need Projection Job Costing 2016 or later.